Whenever someone asks me about Outsider Art, I always find it really difficult deciding where to begin. I know I have already written a ‘brief history’ of Outsider Art on my ‘About’ page, but that is more of an overview in comparison to this post. I thought it would be interesting to share some of the research I did whilst writing my dissertation with regards to the emergence and history of Outsider Art; a ‘movement’ that appears to be floating on the outskirts of traditional art history. This post will locate where I think Outsider Art really came from, and the key exhibitions and events that saw its apparent emergence during the ‘golden years’ of 1880 and 1930. A history of ‘Outsider Art’ is somewhat intangibly difficult to offer. Unlike other art movements, it did not specifically emerge from a precursory movement; it is in essence ‘an art bereft of historical and cultural context.’ However, if we begin somewhere, it is undoubtedly with the change in treatment towards psychiatric patients at the turn of the twentieth century. A more humane philosophy within the psychiatric institutions of Europe meant that psychiatrists were becoming more interested in the day to day lives of their incarcerated patients. In terms of psychiatry and the treatment of the mentally ill, the nineteenth century became the ‘century of the asylum.’ Before this period, patients had been incarcerated in overcrowded, abusive ‘madhouses’, alongside criminals and the terminally sick. Hans Prinzhorn, a pioneering collector of art created by those in psychiatric incarceration, was appointed in February 1919 to oversee the collection of art created by patients at the Heidelberg Psychiatric Clinic. It was Prinzhorn’s Artistry of the Mentally Ill (1922) which really drew peoples’ attention to ‘Outsider Art’ as an aesthetic and artistic endeavour as opposed to a pathological one. Prior to the publication of Prinzhorn’s book, landmark exhibitions of ‘Psychotic Art’ were held in both 1900 and 1913 at Bethlem Royal Hospital, which has a gallery and archives dedicated to the work of its past and present patients. This was seen as quite a progression, considering it was at Bethlem that just a century earlier the mentally ill were humiliatingly exhibited as objects for the entertainment of wealthier classes (see image below). 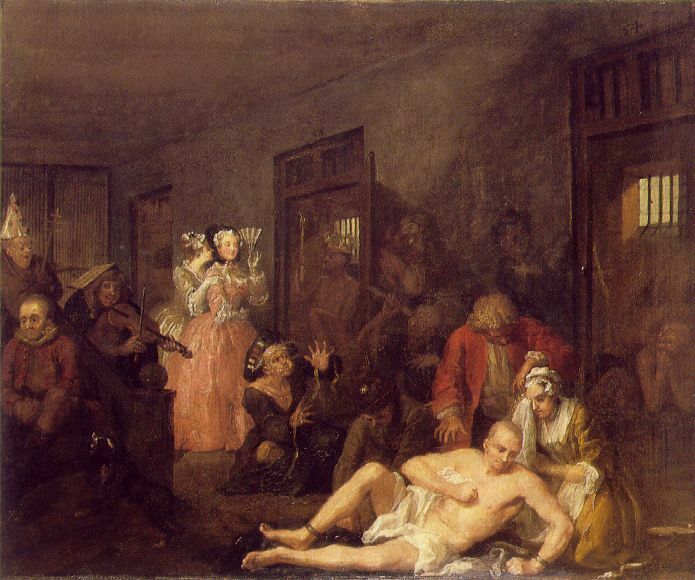 This piece shows two wealthy women who have paid to view the ‘madness’ of Bedlam. Jean Dubuffet, pioneer of Art Brut penned a manifesto entitled Art Brut in Preference to the Cultural Arts inn1949, in which he intended to ‘valorise the idiosyncratic creative works of individuals which he considered to be outside “the system”,’ but also to ‘directly challenge and undermine the authority of “high culture” and conventional definitions of art.’ This manifesto, and this period just after the end of the Second World War, saw a rise in interest in the works of Brut artists, yet Dubuffet was keen to keep these works infinitely separate from works within the ‘cultural mainstream.’ In 1972, Roger Cardinal coined the British term ‘Outsider Art’ as an alternative to the French term penned by Dubuffet. In the present day, we can still see some links to what I will call ‘traditional Outsider Art’; the art described and championed by Dubuffet and the works that Prinzhorn identified in his 1922 publication with regards to what we may include today as ‘Outsider Art’. However, the turn of the twenty-first century has seen the art world become more accepting of ‘Outsider Art’; over a century after its initial emergence. Many of the artists grouped under the term have gone on to find artistic fame within their lifetime; something unheard of during the early years. The term has definitely expanded, and during its expansion, it has become ever more difficult to place it within an art historical context. Since its very first emergence during those ‘golden years’, it has extended over a period of over a century; something which cannot be said for other, more ‘mainstream’ art movements (the isms for example: Impressionism, Fauvism, Cubism etc.). Perhaps it defies an art historical context. This is actually something that I quite like the idea of. Whilst ‘professional’ artists continue to create in a linear manner, with much regard and consideration for what has gone before, ‘Outsider Artists’ make art that is raw and, although not isolated from contemporary culture (this is a whole other debate – Dubuffet’s claim that the work of traditional Brut artists was always, without question, untouched by culture is something I wholeheartedly disagree with in every respect), it is not dependent on what has happened historically. It is art of the people, rather than the art of an era.